Taken from the first definitive introduction to behavioral economics, The Foundations of Behavioral Economic Analysis: Other-Regarding Preferences is an authoritative and cutting edge guide to this essential topic for advanced undergraduate and postgraduate students. It considers the evidence from experimental games on human sociality, and gives models and applications of inequity aversion, intention based reciprocity, conditional cooperation, human virtues, and social identity. 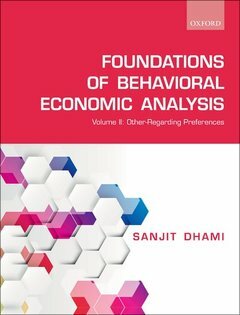 This updated extract from Dhami's leading textbook allows the reader to pursue subsections of this vast and rapidly growing field and to tailor their reading to their specific interests in behavioural economics.